My chosen muse is a common, mundane, disregarded object largely devoid of color. I can't rely on its innate beauty to engage you. But if you look closely an the cement texture, you will discover a rich world of subtleties and beauty. I have always been a realistic painter. I taught myself to paint while serving as a Peace Corps volunteer in Western Samoa. I painted realsitic portraits of the local villagers. After returning to America, I painted realistic wildlife artwork. Ducks, wolves, eagles, hawks. In one moment of clarity, I traded in feathers and fur for mortar and cement. 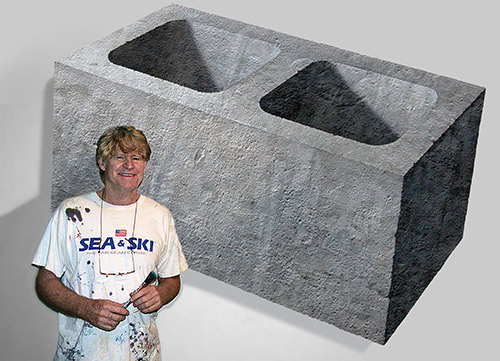 Painting realistic cement took me a long time to master. I think I invented new ways to apply paint. 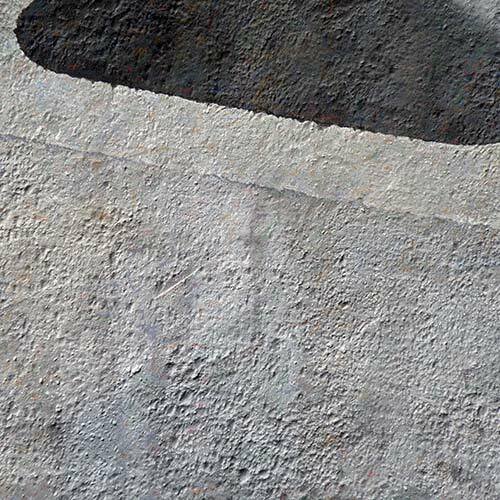 Even though I would love to paint abstraction, the closest I get is in the concrete texture. If you look closely at the detail photo above, it's actually an abstract painting. So what does that make me? An abstract realistist? My artwork is not for everyone. It embraces an urban aesthetic that many do not understand. However, if you want something off the beaten path, something cutting-edge, I may be what you're looking for. Because they are so labor intensive, I can only complete about 10-12 paintings a year. I have shipped to collectors on almost every continent. I'd love to be in your collection.